A newly published study from the Institute of Astrophysics of Andalusia discards possibility that type Ia supernovae might stem from explosions of white dwarfs nourished by normal stars. Were these conclusions to become generalized, type Ia supernovae might no longer serve as “standard candles” to measure astronomical distances. 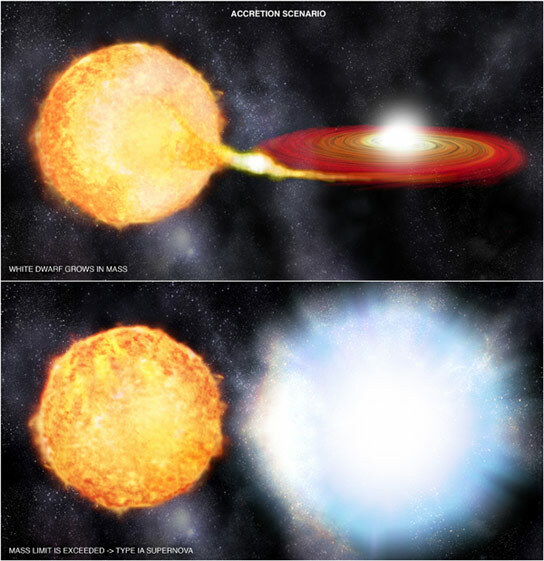 Type Ia supernovae happen when a white dwarf, the “corpse” of a star similar to the Sun, absorbs material from a twin star until it reaches a critical mass–1.4 times that of the Sun—and explodes. Because of their origin, all these explosions share a very similar luminosity. This uniformity made type Ia supernovae ideal objects to measure distances in the universe, but the study of supernova 2014J suggests a scenario that would invalidate them as “standard candles”. “Type Ia supernovae are considered standard candles because their constitution is very homogeneous and practically all of them reach the same maximum luminosity. They even allowed us to discover that the universe was expanding at an accelerating rate. However, we still don’t know what stellar systems give rise to this type of supernovae,” says Miguel Ángel Pérez Torres, researcher at the Institute of Astrophysics of Andalusia (IAA-CSIC) in charge of the study. A new model postulating the fusion of two white dwarfs is now challenging the predominant one, consisting of a white dwarf and a normal star. The new scenario does not imply the existence of a maximum mass limit and will not, therefore, necessarily produce explosions of similar luminosity. The results mentioned above were obtained from the study of supernova 2014J, situated 11.4 million light years away from our planet, using the EVN and eMERLIN networks of radio telescopes. “It is a phenomenon that very seldom occurs in our immediate universe. 2014J has been the Ia type supernova closest to us since 1986, when the telescopes were much less sensitive, and it may well be the only one we’ll be able to observe in such vicinity in the next one hundred and fifty years,” says Pérez Torres (IAA-CSIC). Radio observation makes it possible to reveal what stellar systems lie behind type Ia supernovae. 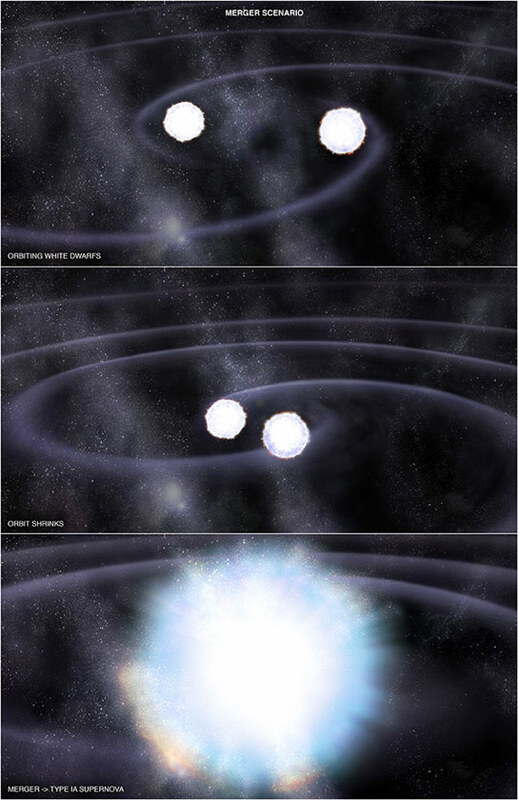 If the explosion proceeds from a white dwarf being nourished by a twin star, for example, a great amount of gas should be present in the environment; after the explosion, the material ejected by the supernova will collide with this gas and produce an intense emission of X rays and radio waves. By contrast, a couple of white dwarfs will not generate this gaseous envelope and, therefore, there will be no emission of either X rays or radio waves. “We have not detected radio emissions on SN 2014J, which favors the second scenario”, says Pérez Torres. “If these results were to gain general acceptance, the cosmological consequences would be weighty, because the use of type Ia supernovae to measure distances would come into question,” the researcher concludes. 1 Comment on "A New Supernova Model Challenges the Predominant One"
The DD SN1a model is not NOT new. It has been proposed 30 years ago by Webbink and independently by Iben & Tutukov.